Scientists led by UNC Lineberger member John Sondek, PhD, created a new biochemical tool to block specific types of downstream G-protein signaling, opening new avenues of research and potential drug design and discovery. 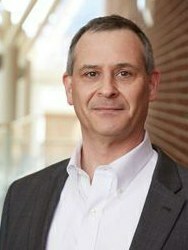 John Sondek, PhD, is a professor in UNC’s departments of pharmacology and biochemistry & biophysics. Scientists led by a UNC Lineberger Comprehensive Cancer Center researcher have developed a new tool for studying a key process in cells called G-protein signaling, which plays a central role in the normal functioning of cells and can go awry to cause severe disease, including cancers. Scientists have had few good methods for manipulating and investigating G-protein signaling. Now, UNC scientists have developed small proteins called peptides that selectively block a certain type of G-protein signaling. The peptides comprise a unique and powerful tool for studying this type of signaling and the processes in cells that depend on it. Based on this initial work, published in the Journal of Biological Chemistry, the researchers are now making related peptides that can block other types of G-protein signaling. Aside from their value as basic scientific research tools, these peptides will be used to develop potential drugs for diseases involving abnormal G-protein signaling, including a form of melanoma for which there is currently no cure. “These peptides should be valuable for drug design and discovery, and for understanding fundamental aspects of cellular biology,” said John Sondek, PhD, senior author of the JBC paper and professor in UNC’s departments of pharmacology and biochemistry & biophysics. G-proteins work as a sort postal service hub within the cell. They receive signals from outside the cell via partner receptors on the cell surface, and G-proteins help deliver those signals to their proper destinations within the cell. These signals are vital for proper cell function and, as a result, proper overall health of the individual. G-proteins sit on the inside of the cell membrane, close to their partner receptor. They exist in a complex made of three related subunit proteins: Gα, Gβ, and Gγ. An incoming signal from the partner receptor “activates” this complex causing the Gα subunit protein to separate from the other two. This activated form of Gα can then interact with various molecular partners to send signals deep into the cell. In humans and other mammals, there are four main families of Gα proteins, each with its own set of downstream signaling partners. Although nearly a third of modern medicines work by targeting receptors that signal via G-proteins, researchers have not had very good tools for studying the signaling pathways that run downstream of G-proteins. In this project, Sondek and his colleagues successfully fashioned one such tool – a peptide that selectively blocks an important class of Gα proteins, Gαq, from interacting with its downstream signaling partners. The team crafted the peptide using clues from structural studies of one of Gαq’s known signaling partners. The peptide essentially mimics the binding region on the signaling partner. In further work funded through a new NIH grant, the Sondek lab has been developing versions of the peptide that bind even more tightly to Gαq. The researchers also plan to use the same strategy employed in this project to make peptides that selectively inhibit the other main Gα protein families, Gαs, Gαi, and Gα12. One way to use such peptides is to block the signaling that runs through the Gα protein, to see what happens in a cell when that signaling is lost and thereby learn what that signaling normally does. Another method is to genetically combine the peptide with a special fluorescent protein, in effect “lighting up” peptide-bound copies of the Gα subtype. “In this way, we can see in real time where exactly these activated Gα proteins are working in cells and how many of them there are,” said Sondek, who is also a member of the UNC Lineberger Comprehensive Cancer Center. The peptides can also be used for drug discovery. Scientists can screen collections of small organic molecules – the type of molecules needed for pill-based drugs – to find any that compete with the peptides by binding tightly to Gα proteins and preventing them from transmitting signals. Those that do may be developed into potential Gα-blocking drugs. In principle, the peptides themselves can be used as Gα-blocking drugs, although they usually can’t be delivered in pill form. Given the importance of G-protein signaling in cells, studies of downstream signaling pathways with the new Gα-blocking peptides are likely to reveal many new targets for future drugs, Sondek said. But at least one of these drug targets is already known – Gαqitself. A rare and often-fatal form of melanoma known as uveal melanoma, which originates in the eye, is typically driven by mutations to Gαq’s gene, leaving the protein Gαq in an always-active form. A drug that simply blocks Gαq signaling may therefore help patients with this illness, which spreads beyond the eye in half of known cases. Once the cancer metastasizes, patients do not respond well to existing treatments. He and his team, in collaboration with pharmaceutical company AstraZeneca, are currently using the new peptides to discover Gαq-blocking compounds that might be developed into treatments for this form of cancer. Sondek hopes ultimately to extend this line of research to find blockers of other proteins that are related to G-proteins but have other important roles in cells. These include the Ras cell-growth proteins, mutated versions of which are among the most common and relentless drivers of several kinds of cancer. Co-authors of the study were former UNC postdoc Thomas Charpentier, PhD; UNC research analyst Gary Waldo; NIH scientist Emily Lowery-Gionta, PhD; UNC assistant professor Krzysztof Krajewski, PhD, director of the UNC High-Throughput Peptide Synthesis and Array Core Facility; Brian Strahl, PhD, UNC professor of biochemistry and biophysics; Thomas Kash, PhD, the John Andrews Distinguished Professor of Alcohol Studies in the UNC department of pharmacology; and Kendall Harden, PhD, professor emeritus in the department of pharmacology. The National Institutes of Health and the Melanoma Research Foundation funded this research.